Vice President Joe Biden, who is mulling a bid for president, will be one of Stephen Colbert's very first guests on the "Late Show" next week. Colbert himself announced the booking via Twitter on Tuesday afternoon. He'll be welcoming Biden on Thursday, September 10. 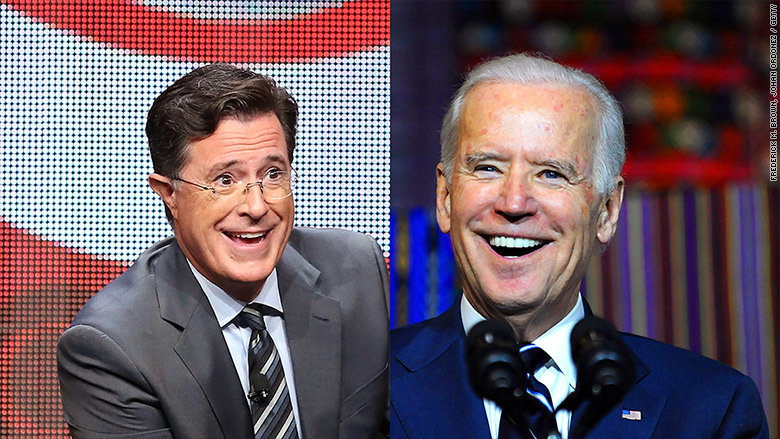 There was immediate speculation that perhaps Biden would share some campaign-related news with Colbert, the former faux-conservative-pundit of Comedy Central's "The Colbert Report." Colbert takes over CBS's "Late Show" next Tuesday. His predecessor David Letterman hosted any number of politicians over the years, including Bob Dole, who confirmed his plans to run for president on the "Late Show" in 1995, and John McCain, who did the same thing on the same show in 2007. September 10th, #LSSC welcomes @VP Joe Biden! Wait, if he's here, who's Vice Presidenting the country? Colbert's vice presidential announcement came hours after NBC said Donald Trump would be appearing on "The Tonight Show with Jimmy Fallon" on September 11. Trump apparently spurned Colbert, whose team had been trying hard to book the Republican presidential front-runner. The real estate mogul told the Hollywood Reporter last month that Colbert asked him to appear on the "Late Show" premiere, but he hadn't "accepted yet." For Trump, the "Tonight Show" appearance will mark yet another return to the network that cut ties with him earlier this summer. Following Trump's inflammatory remarks about illegal immigrants, NBC severed its business partnership with Trump, ending the billionaire's hosting role on "The Apprentice." The move also meant the Miss USA pageant, which had been jointly owned by NBC and Trump, will no longer air on the network. Trump blasted NBC for the decision, and even suggested that he may take legal action. And he has insisted that he ended the relationship with NBC, not the other way around. Despite any lingering bad blood, Trump and NBC haven't ignored each other. Trump appeared on the network in August for an interview on "Meet the Press." Today's bookings are the most recent examples of 2016 contenders venturing into the late night arena. Fallon interviewed New Jersey Governor Chris Christie on Monday, while Jeb Bush appeared on the "Tonight Show" in June after he launched his campaign.